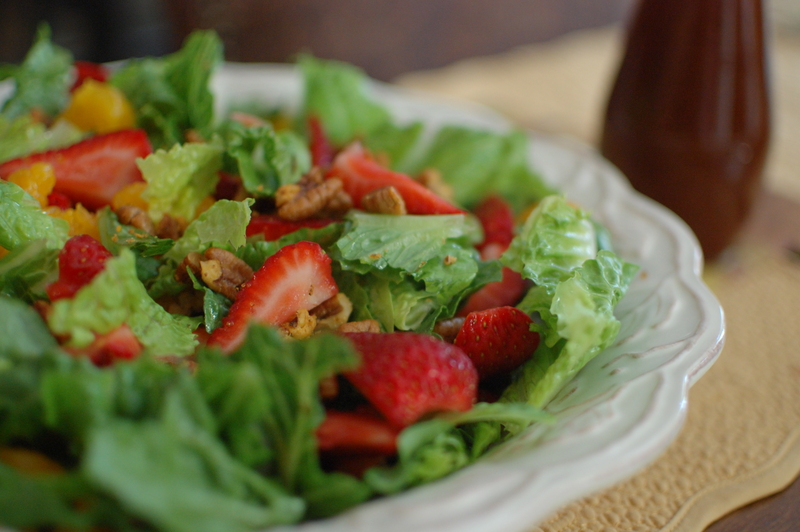 Here is a great summer salad that you will want to make with all the fabulous strawberries that we have now. These flavors from strawberries, mandarin oranges, and avocados just go together to make a fantastic combination that I would not ordinarily put together. And the avocado in this salad oh my! If you are looking hard to see the avocado you won’t. I served this salad to my book club last month and in the hustle and bustle to make a photo without holding up serving the food I forgot to add the avocado. But, don’t you leave it out thinking that it will be just as good without it. It won’t be! You’ll miss that buttery flavor. Trust me. I love this Cinnamon vinaigrette. It is a lovely salad dressing and a snap to make. I really cannot believe that today is July 1. In 30 days school starts and I must get busy on my To Do list which is absolutely nothing! Enjoy your summer.